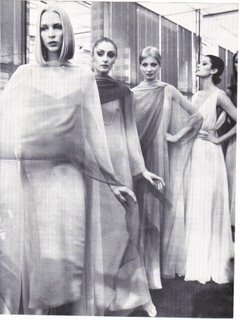 Here are some examples of Halston's chiffon beauties, the incredible thing about his clothes was their movement! This was due to thier construction, or lack of, the patterncutters were absolute magicians there, and they had to be to meet the demands of Halston's imagination. 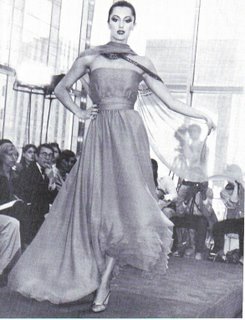 Many dresses were made with one continuous spiraling seam, with full bias cut 360 degree skirts. The innovation in cut is what clearly set him high above his peers. At his height, his only match in prestige and influence was the formidible Yves St. Laurent! So there were two schools of thought, American simplicity versus European extravagance!